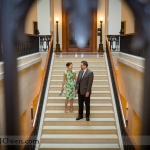 Danielle & Greg were married at the Minnesota Judicial Center, adjacent to the MN State Capital. These two are long-time friends of mine and it was great to join them and their families to photograph their wedding. I love the casual yet elegant outfits! Big congratulations you two! Minnesota Wedding and Portrait Photographer - © 2018 David J Owen Photography LLC|ProPhoto Custom Blog by NetRivet, Inc.